Eric and I began our friendship while we haggled over a price for the print of "Here Fell Custer". 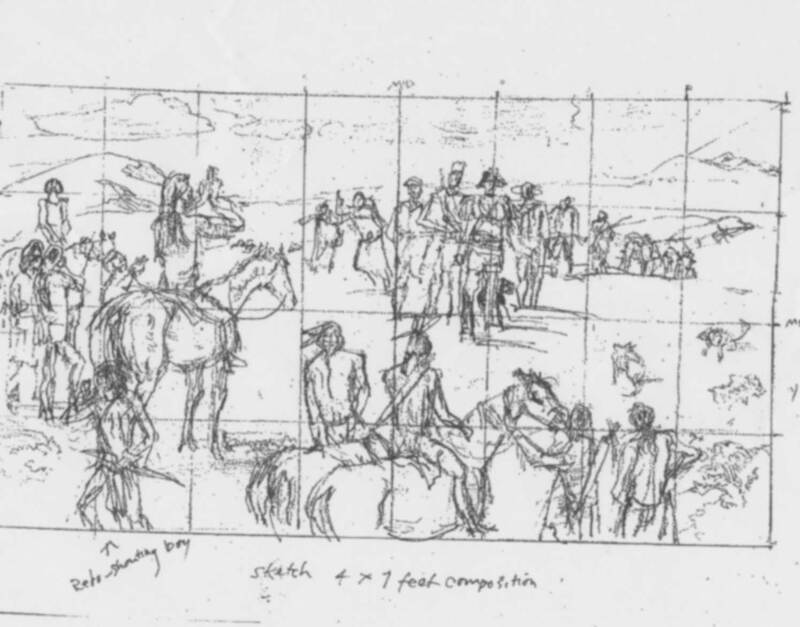 The prints were to be sold as a fundraiser for the Friends of the Little Bighorn Battlefield. Our common interest in music, movies, history and friends resulted in a “fast” friendship even though we’re a generation apart. 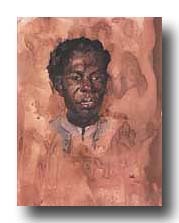 Over the last several years Eric has been immersed in painting a series of works, "Giants of the Blues" covering the early history of folk and blues (Eric is well known and respected in the folk/blues music industry—he received a lifetime achievement award from ASCAP in June 2001. He was also the inspiration and mentor of Bob Dylan. 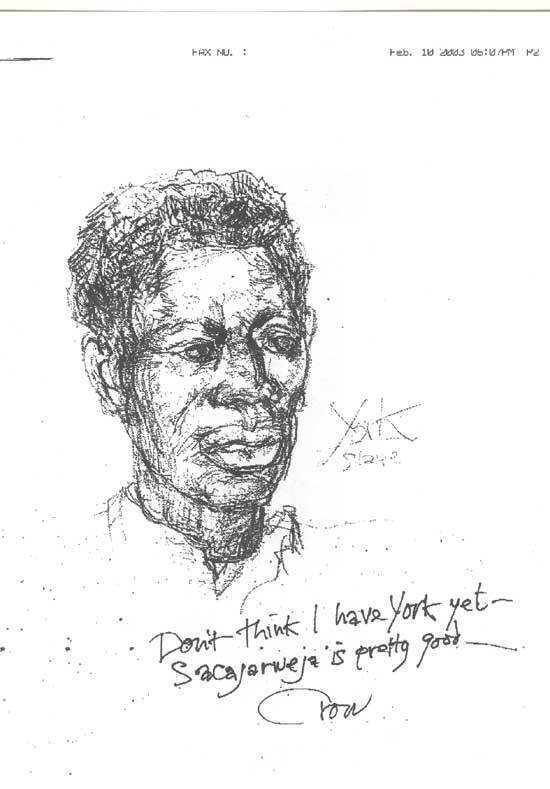 Dylan showed up one day, unannounced, at Eric’s doorstep and ended-up camping out on Eric’s couch for sometime during the Cambridge folk scene of the early 60s). During one of our conversations Eric mentioned he might start a painting about the outlaws which would highlight Billy the Kid, Butch Cassidy and the Sundance Kid, Jesse and Frank James to name a few. I said it sounded like a good idea, but I thought he might want to hold off on that one for a while. You see, Eric spent five years painting “Here Fell Custer” and completed it just in time for the centennial of the Custer Battle in June 1976. He also finished the 23 foot long, “The Storming of the Alamo” for the sesquicentennial of the Battle of the Alamo in March 1986. 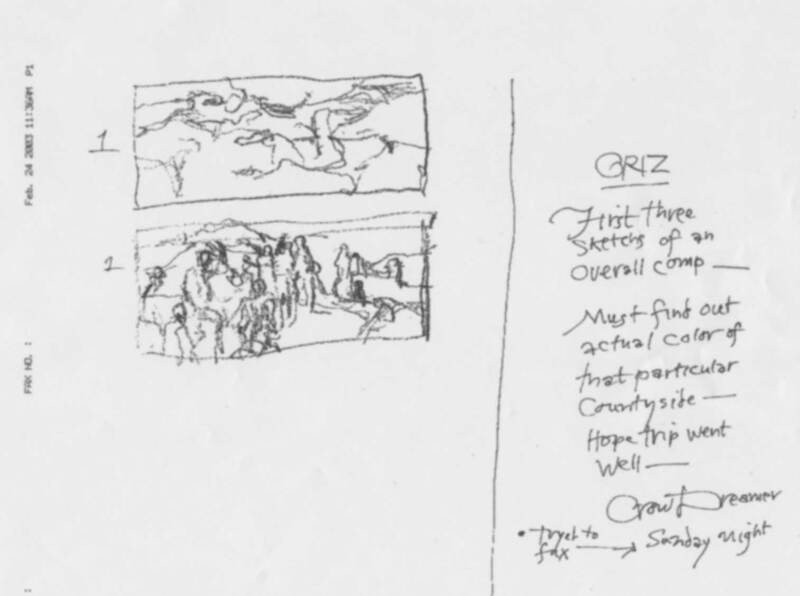 I felt it would be awesome if Eric created his next masterpiece for the bicentennial of the Lewis and Clark Expedition. We both agreed this was a great idea and became energized in the process of researching the topic and brainstorming ideas for the subject matter. What Should The Painting Look Like? Eric’s first thought for the subject at hand would be during the Corps of Discovery’s winter with the Mandan in 1804-1805, a good idea, but Eric wanted SKY and I wanted to see mountains!!! The best place for sky and mountains on the path of the explorers was Montana and a lot of dramatic stuff happened to the Corps of Discovery while in Montana. They reached the headwaters of the Missouri near present day Three Forks, Montana and endured the extreme physical hardships of the long portage around the mighty falls of the Missouri near present day Great Falls. If that weren’t enough they then had to cross the Bitterroot Range which was no picnic in the park and Lewis and his small party had the only firefight of the entire 26 month long exploration of the west when they killed one or two Blackfeet warriors attempting to steal Lewis’s horses. Eric knew he wanted Sacajawea in the picture from the outset, so that helped us screen out some of the events. All these scenarios would make for great paintings, however, there was one event that was important, dramatic and seemed to capture the meaning and importance of the Corps of Discovery’s two-year odyssey. On August 17, 1805 Lewis and Clark met with the Shoshone led by Cameahwait. (The purposes of this meeting are discussed on our home page.) I suggested this idea to Eric; he loved it and went for it like a wild banshee. Eric supplied me with daily faxes of his sketches. I helped supply some quick needed information that I gleaned from my library and the web. I was amazed, and still am, at how fast Eric can put a picture together. He’d have changes made that affected the entire picture in less than 24 hours. I can barely complete a stick figure in that timeframe! 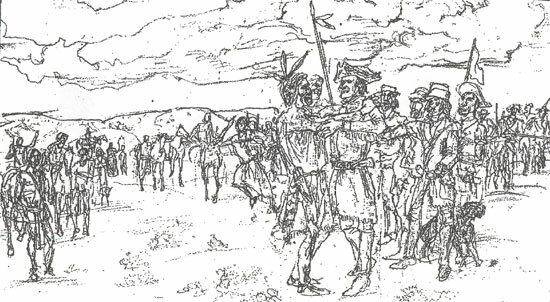 The first series of sketches showed the Corps approaching the Indians from the perspective of the Indian. It was a great composition, but it didn’t represent the diversity of this expedition in race, religion and gender. Its image seemed to represent a division between the Corps and the native people it met. That was not the intent of the Corps in its dealings with the American Indians they met along the way! These white men spent their first winter on the cold plains beside the several villages of the Mandan-Hidatsa. Yes, they built a small stockade they named, “Fort Mandan”, however the door to the fort was always open (for their neighbors). During that winter both people shared their culture, their stories and their livelihoods. Some evenings Lewis, Clark and the other men would visit the Mandan village to partake of the Indian’s music and dancing while other nights the Mandan would enjoy the white man’s fiddle, singing and dancing inside Fort Mandan. All members of the Corps enjoyed the winter of 1804-1805. 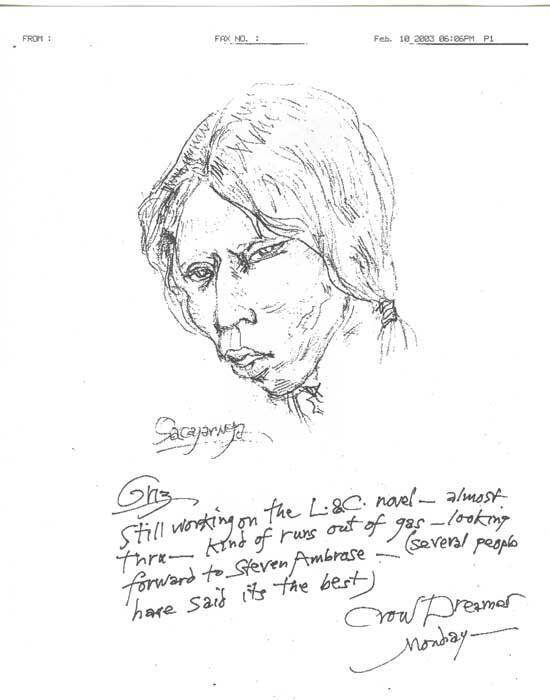 In the early sketch of this new composite, Eric placed Sacajawea in the background while running toward Cameahwait at the moment she recognized him as her long lost brother. 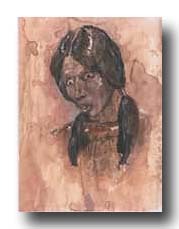 She needed to move closer to the action -- Sacajawea was one of the reasons why the Lewis and Clark expedition survived let alone found the Pacific. Eric brought her forward center providing us the opportunity to witness history at that moment Sacajawea came home and found her family once again. Recently Eric began the process of moving from sketches to canvas. His 7 X 4 foot acrylic on canvas is beginning to come alive with the men and women of the Corps of Discovery and the Shoshone people, Montana mountains and Big Sky. We will continue to share with you the stories of Eric’s painting Lewis and Clark and photos of the painting itself. We hope you will come back to visit often. 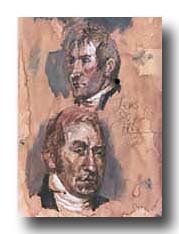 The three colors below are drawn on brown (coffee) stained paper, highlighted in white acrylic.